From the bottom ledge of the LG Spectrum 2, you can start on opening the cover from this side-edge. Insert your fingertips (can be your thumbs or index finger) or if you confident that your fingernail is strong, you can insert to the gap on the cover, then gently lift it up or against the body to make the cover half bottom removed. Then continue to remove all the ledges of the cover with your fingernail to make sure all the cover sides detached and removed from the body of the phone. For your information, LG Spectrum 2 is the phone with battery capacity 2150 mAH when it had assembled on the device is has an ability to be charged via wireless charging pad. But you have to get this charging pad separately (need to be bought first). Placing back the cover. Align the cover casing over the body with ledges are fitted with the edges of the cover and camera hole are in its place with rear 8 Megapixels camera, then press the cover down until it successfully attached. You might heard a click sound while doing it. Don't worry it means the cover locks in its position. After you opened the cover, you can assemble the battery. Align the metal connector of the battery and the one available on on the top wall of compartment , make sure the LG logo is facing up, then press it downwards until the battery fully and perfectly assembled. Use your thumbs to push the battery down while you holding the body of the Spectrum 2. It's always a recommendation that you should remove the battery out from its compartment whenever you wanna install / insert the SIM card onto its slot. There is a cut-gap on the bottom of the battery compartment. Use this gap as a removing point. Insert the finger into this cut-gap then with a little press against the battery, lift the battery upwards, then grab the battery out (Pictured). Remember to turn off the phone before you disassemble the battery. 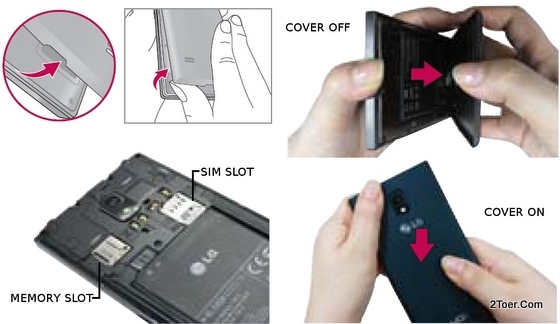 The SIM card slot on this LG Spectrum 2 locates on the right-upper side of battery compartment. With gold-contacts facing downwards (you'll must see the Verizon logo facing up; yes the LG Spectrum 2 is a device bundled with Verizon Wireless Mobile Carrier) and the cut-edge on the inside position (pictured), push the card into the slot until its reach the end of the slot. Use your fingernail to push it inside. To remove the SIM card, you have to get attention on the mouth of the slot where the SIM is partly seen sides. In this side you can slide the card out using your fingertips. If there is a problem on sliding the SIM card out, there is a tiny gap on the end of the slot, use this gap to push the card out. You don't need to know this step on inserting the Memory Card if you don't want to add additional storage via microSD slot. For the microSD Memory card slot, it locate on the left of rear panel. Just make sure the gold-contacts of the microSD card facing downwards, then slide and push the card until it perfectly inserted. Draw the card, and pull it out if you wanna remove it. Remember to unmount it first via Apps > Settings > Storage > Unmount SD Card > OK, if you wanna remove it. Two ways on doing Factory Reset / Hard Reset on LG Spectrun 2 VS930 for Verizon: Hardware way and Software way. Hardware: Turn off the phone > Press and Hold for 6 seconds Power button and Volume Down key at once > Whenever "Permanently Erase User Data & Reset Settings?" appears, release all the key > Press Power key to continue Hard Reset (any other key/button to cancel it) > Pop up "Are you sure you want to continue with erase? ", Press Power key to confirm > Wait till the Hard Reset progress is done. Software: Go to Home Screen > Menu > Settings > Backup & reset > Factory data reset > Reset phone > Erase everything. All the data will be erased, therefore it's better that you backup all the data including photos, videos, documents before you perform Master Reset. You can also do this action in case you forgot the unlock pattern of your LG Spectrum 2.